This coming weekend – on Saturday – is “Take a Walk in the Park Day”! What will make that day more meaningful (and fun!) for you? Take your DOG for a Walk in the Park! We are fortunate in the Richmond area to have so many beautiful parks. In fact, it can be mind-boggling to choose where to go! To help you decide, we’ve gathered information on some of the most popular dog-walking parks in the area, broken-down by county. We have also included helpful details about the size of the park and whether or not trails of any kind are listed in the park. 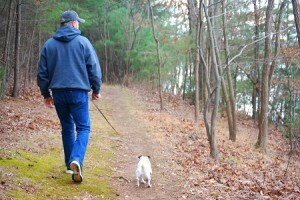 View our list of dog-friendly parks in Virginia. We recommend you contact the park directly if you are unsure. Except when specifically posted, please keep your dog leashed. Fines of up to $250 can be issued for unleashed dogs, not to mention that it’s just not safe. And please, let’s be good stewards and pick up our dog’s waste. We hope to see you on the trails on “Take a Walk in the Park Day”! Error: Error validating access token: Session has expired on Monday, 29-Oct-18 09:08:51 PDT. The current time is Thursday, 18-Apr-19 19:55:00 PDT.